snaggle tooth: cup cakes cup cakes cup cakes yum. cup cakes cup cakes cup cakes yum. 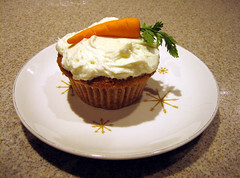 Tonight I made Carrot-Ginger Cupcakes with orange-ginger cream cheese frosting and marzipan carrots. They are so tasty I love them. I never imagined in a million years that I would make marzipan, in fact I always wondered who on earth makes that stuff. Well the answer is now me. 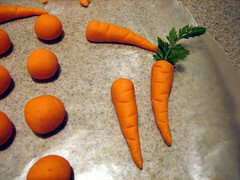 Here are the marzipan carrots being made. It was touch and go for a while as we dumped obscene amounts of confectionars sugar into the mix but we made it in the end. And here is the most beautiful carrot on the most beautiful cupcake. Did I mention they are delicious? Yum.